The Art of Compromise: Residential Architect…or Relationship Counselor? “This isn’t going to have a good outcome. She’s your sister, which means she’s going to get what she asked for, and I’m going to have to live with it.” My brother-in-law was joking when he said it, but there was a ring of truth to his suspicion. After all, why wouldn’t I take my sister’s side when it comes to a family squabble? 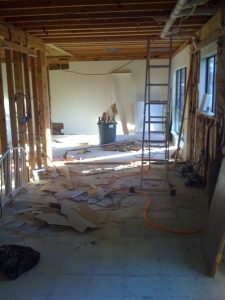 My brother-in-law, Todd, immediately decided that flying his architect sister-in-law (that would be me) out to Texas to offer up some advice and design on their newly gutted first floor living space would be the best way to soothe Heather’s concerns. The only problem is, once I got there, it became very apparent that the happy, expecting couple did not see eye-to-eye on what they wanted out of the renovation. 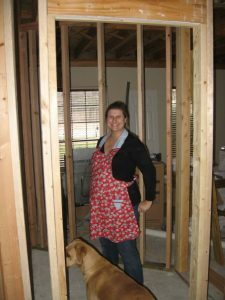 Heather’s biggest concern was that she wanted the biggest kitchen and pantry possible. Todd didn’t want to sacrifice space in the living and dining room beyond. Neither one was budging. And Todd was getting nervous that I would “side” with Heather. Unbeknownst to me at the time, Heather snapped a pic of me unwittingly wearing my “Little Pink Houses” shirt while sketching some ideas for them. My response was, “if I finish the design and both of you aren’t happy, then I haven’t done my job.” This put Todd’s mind to rest. And then we set to work on making some compromises. 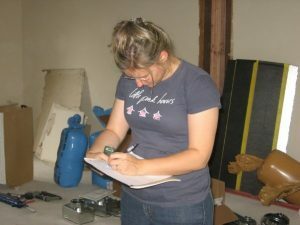 I often quip that you need experience in relationship counseling to be a successful residential architect. 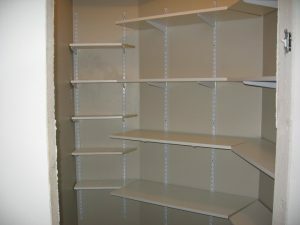 I can’t, and won’t, tell you how many times I’ve sat in a meeting when a wife, upon hearing that we have to reduce the scope and she might have to lose her office, angrily insists that if her office goes, then her husband’s wine cellar/man cave/whatever has to go, too. I use my sister and brother-in-law as an example (with their permission) so I can protect the privacy of my non-relatives, but across the board, when it comes to something as personal as your home, absolute strangers suddenly become completely comfortable fighting in front of me, the contractor, and anyone else, when something they really want is at stake. And it can get downright personal. But it should be personal – after all, your home is your sanctuary, where you start your day, end your evening, and enjoy life. 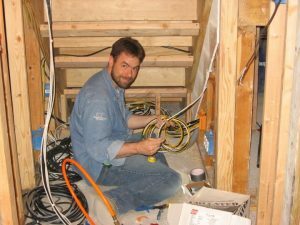 Todd, my DIY-superstar BIL, under the newly configured stairs, installing wiring for whole-house A/V. Now, compromise is generally considered a bad thing – everyone has to give something up; thus, lose-lose. One of the values a residential architect provides is that we can assess from a new perspective, and often can come up with a different kind of compromise. This type of compromise blends the qualities of two different things together in a new way, rather than eliminating two things altogether. In other words, we can creatively replace “either/or,” or even “neither,” with “both.” In the example above, why couldn’t she have a more modest-sized office with built-ins for his wine collection? Win-win is always better than lose-lose. However, sometimes we exhaust all avenues and we do have to cut something to make a budget work. When compromise looms on the horizon and a big-ticket item simply has to be cut out of the scope, there are a few things I recommend. First, before asking your partner to sacrifice something, make sure you’re willing to offer up something, too. It’s about finding balance, because if one person makes all of the sacrifices, it eventually means they will be unwilling to make any sacrifices. 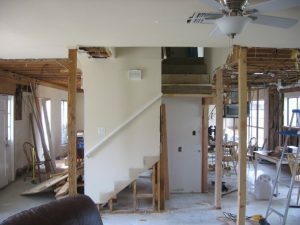 Reconfiguring the stairs to bring them up to building code and make them safer was a “non-negotiable” for both Heather and Todd. Wasted space below the stairs was repurposed for the kitchen refrigerator, convenient taps for homebrewed beer, and the whole-house A/V system. And, no matter how long you’ve known the person with whom you’re embarking on this new adventure, never assume that you know what the other person wants. Everyone changes as time goes on, and surprise, your husband may not want the large wraparound deck for neighborhood barbecues anymore. Maybe now he wants a cozy, intimate screen porch just for the two of you instead. In case you’re wondering, compromise is not just something my married/partnered clients have to do. Often, we negotiate between clients and their contractors to find creative solutions, too. For example, if having both a sunroom and a screen porch is out of the budget, perhaps we have a larger four seasons room to achieve the goal of both. Or, we design a screen porch that has removeable panels that can be inserted during extreme weather to make the space inhabitable year-round. Both achieve different goals – it’s just a matter of what you want more: to feel like you’re inside, or to feel like you’re outside, in this case. Heather, about 7 months pregnant and in full “nesting mode,” happily standing with pup Jackson in her future (large!) pantry. Whether negotiating with a partner, a contractor, or otherwise when it comes to your house, make a list of your priorities. What are you willing to be flexible with? What is non-negotiable? In Heather’s case, the pantry was non-negotiable, and in Todd’s case, a large living room was non-negotiable. The solution? By “cutting the corner” out of the pantry, we kept the living room as large as possible for Todd, but still left a long wall in the pantry for shelving. Instead of using some of the pantry shelves for pots and pans, Heather compromised and we left one pantry wall blank for hooks so she could hang them instead. So, how did it all turn out in the end? Heather and Todd now have two young kids, and have that pantry stocked to the brim with food and supplies for their young family. The large living room became a multifunctional room for kids’ activities. Heather and Todd were so pleased with the interior work, they hired me to come back the following year to design a two-story porch addition in the style of the Texas hill-country homes. Their only complaint? The number of people who still stop in their driveway to take photos of it. An angled wall in the pantry still achieves plenty of storage, without taking up too much space in the living room on the other side. The house’s original Colonial Revival façade (left), was updated with a Spanish Colonial two-story porch that includes stone piers, rough-sawn columns and shutters, and a simple wrought iron railing, much more reminiscent of local Texas hill country homes. The porch also provides shelter from harsh Texas sunshine and thunderstorms alike.